Curnow Group project manager Chris van Vuuren said staff working on the coastal protection project helped the pair on September 11. ‘They wanted to drop one off on the beach (but) they were turned over by the waves at the groyne,’ he said. 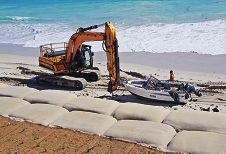 After turning over the upside down boat on the beach, Mr van Vuuren said the excavator dragged it past the sand bag wall and up the dunes to the southern end of Frederick Stubbs Park. ‘We towed it right up to our site office,’ he said.